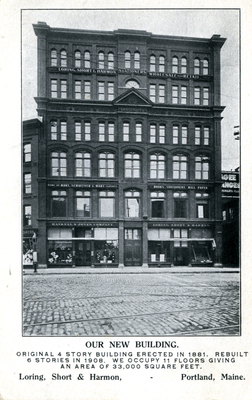 "Loring, Short, and Harmon - Portland, Maine"
Full exterior view of Loring, Short, and Harmon (Lancaster Block), at 474 Congress Street. Original 4 story building was built in 1881, and 2 floors were added in 1908. Photo taken from north, on Preble Street at Congress Street. "Loring, Short, and Harmon - Portland, Maine" (2013). Portland Postcards. 31.